The Kiwi Skate programme has been developed by the New Zealand Ice Figure Skating Association to introduce people of all ages into ice skating, and to develop basic skills on ice. The programme caters for all ages from four year olds to pensioners. The main objectives of the Kiwi Skate school programme are to improve skaters confidence and skills on the ice. 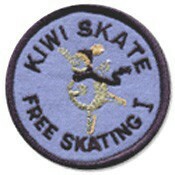 A series of skating skills tests have been developed by the NZIFSA and skaters are issued with a badge when they pass each test.